For $200,000 a year, guaranteed for 20 years, totaling no less than $4 million, you could have the second-busiest subway station in Brooklyn named after you... or your product. This station, "the nexus of subway stops at Atlantic Avenue, Pacific Street and Flatbush Avenue in Downtown Brooklyn," we read in The New York Times, is about to be sold, however, to Barclays, becoming Barclays Station. “They can call it anything they want, as long as my train’s on time,” one regular commuter quips – but to what extent is that really true? 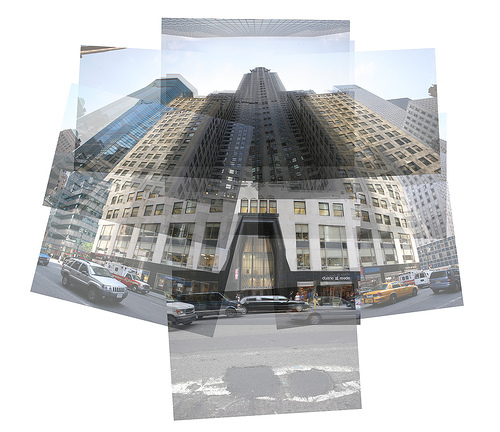 [Image: The Chrysler Building – a sponsored building – montaged by Flickr-user Chalky Lives]. For instance, the same article cites several rejected proposals for the renaming of urban infrastructure – but $4 million is not, in many contexts, even a very large sum of money. Super Bowl ads famously cost as much as $6 million dollars a minute – in which case $4 million for twenty years' worth of public exposure is almost absurdly underpriced. In fact, the average marketing budget of a Hollywood blockbuster could quite easily absorb the cost of renaming a minor New York City subway station for the next decade – well into that film's second life of digital sales, that is – and, to use another example, buildings are still known as, say, the Die Hard Building twenty years after the fact, even if they were never official renamed. Somewhat bizarrely, for instance, I read literally just today that screenwriter Joe Eszterhas was paid $3 million, in 1992 dollars, for writing Basic Instinct – but he could simply have had a Manhattan subway station named after him. Perhaps Shia LaBeouf should forego monetary payment altogether for the next Indiana Jones film – and get a new freeway in Los Angeles named after him. In any case, as private sponsorship of public space becomes the urban norm, will we see acts of infrastructure becoming little more than spatially immersive forms of corporate advertisement? If a Stephen King novel coming out next year had a small bridge in Maine named after it – for the next twenty years – the It 2 Bridge – surely this would not be a bad way to give King's novel near-permanent cultural exposure? Put another way, why buy one minute of Super Bowl time when you could buy twenty years' worth of high-density urban exposure, associating a certain sidewalk, bridge, museum, or subway station with you and/or your product? I'm reminded of the recent news that Kentucky Fried Chicken had branded paving installed atop Louisville potholes – fixing the city's broken streets even while reminding everyone who lived there where they could buy fried breast meat. Jason Kottke points out, after all, that institutions such as Rockefeller Center and Columbia University are also sponsored, in the literal sense that their names were allocated way back when based on who supplied the money. The Chrysler Building is another obvious example. In the end, then, if you went to work each day boarding the subway at Terminator Salvation Station, surely at least for someone born today, taking that commute in twenty years' time wouldn't even seem that strange? Sponsor a tectonic plate. Sponsor a moment in time. Sponsor fifteen minutes of foreign bombing: "Aid raids over Afghanistan today were brought to you by Target™..."
When will urban or national infrastructure simply become another form of advertisement? Perhaps it won't even be long before we start sponsoring lifeforms – newly discovered rain forest birds named after a Latinized version of Bayer, or entire new microorganisms engineered from scratch in university labs, named after the next film from Pixar. Hi -- I link to your blog from mine, and this is a link to my post of today. Re Google and Blogger, not about geology. I didn't see a usable email address for you. I'd just note that this trend extends back many hundreds of years, perhaps the most well-established form of advertising. Take Pennsylvania, for example. Or Harvard. "Year of the Depend Adult Undergarment," anyone? Alexis, there's also Rome (Romulus), Constantinople (Constantine), and so on... But I'd also suggest a difference between honorary naming and sponsored naming, where the latter is specifically part of a commercial calculation. Brandon, nice to see DFW living on in all but name...! My alma matre, Binghamton University, supposedly has the name of our School of Management up for "sponsorship" (sale for advertising would be a dirty term for an academic, state funded research institution) - the price tag is $5 million. Our scholars program already has the PricewaterhouseCoopers (accounting firm) name on it, which wasn't really a bad thing as we were introduced to several high-level partners on numerous occasions. While advertising is usually pretty annoying and perhaps sometimes poisons spaces, I'd rather see marketing dollars spent to help fund infrastructure improvements or build playgrounds than spent to fund more television shows or traditional billboards. I've long thought that political campaigns should start advertising this way. That way, something concrete and useful would remain after the elections. @Steve - I'd prefer if we used tax money on infrastructure; public transit, public schools, public spaces. You know, instead of allowing advertisers sweep in and privatize these areas after decades of Republican social spending cuts. I think for enterprises like movies, the thinking is more short-term; marketers would rather have a few weeks of blanketing the nation in ads than two decades of highly localized exposure. But this approach makes sense when the product itself is highly localized, like a sports arena. Another recent example was when subway conductors started saying "Top of the Rock" every time they pulled into the Rockefeller Center station to advertise the recently opened roof deck, pretending it was as much a landmark as the center itself.